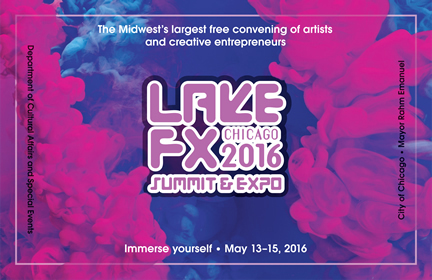 The Chicago Department of Cultural Affairs and Special Events (DCASE) is pleased to announce the second-annual Lake FX Summit + Expo, the Midwest’s largest FREE convening of artists and creative entrepreneurs, May 13–15. Following 2015’s inaugural event, which drew 10,000 attendees, this year’s event will feature nationally-renowned speakers, including: Charles Adler (Kickstarter co-founder, designer); Nick Cave (sculptor, dancer, performance artist); Graham Elliot (chef, restaurateur, television personality); Rodney Jerkins (producer, composer, musician); Ramsey Lewis (composer, pianist, radio personality); Maria Pinto (fashion designer, artist, entrepreneur); Tanya Saracho (playwright, television writer); Regina Taylor (television and film actress, playwright)—and many others. This year’s Lake FX is themed “I’m in!” and asks attendees to immerse themselves in conversations, demonstrations and networking opportunities. More than 100 talks, panels and workshops – on topics ranging from marketing and engagement strategies to legal, financial and space issues – will be presented by industry experts for those working in the culinary, fashion, film and media, music, performing arts, technology and design and visual arts fields, with select programs identified for emerging artists and creatives. We are living in a new renaissance – one in which creatives are at the center and in control of their own direction. Kickstarter co-founder Charles Adler explains his visionary endeavor Lost Arts, a blend of laboratory, woodshop, atellier, incubator and playground. Get tips on using today’s leading platforms to customize audience experience and build your reach through storytelling, idea sourcing and converting customers into cheerleaders. Some of Chicago’s innovative thinkers and platform builders talk about their experiences taking a product, service or creative idea to market. The Chicago Cultural Center (78 E. Washington St.) will be the Lake FX hub, with additional events taking place at the Gene Siskel Film Center (164 N. State St.) and the Hard Rock Hotel Chicago (230 N. Michigan Ave.). The event is free, and registration is at lakefxchicago.us.